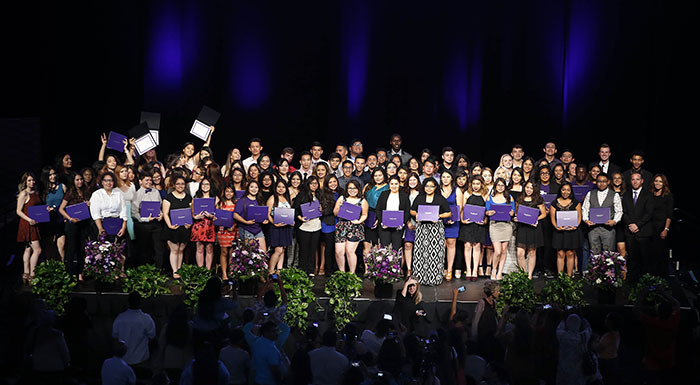 The 100 local high school students who received “Students Inspiring Students” scholarships gathered at GCU Arena. Pahoran Fornes always had one goal — to make his parents and siblings proud. He played sports, kept his grades up, volunteered within the community, attended church and looked after his brothers. It was a tight-knit bond. But that cocoon was unraveled during his sophomore year at Washington High School in Phoenix when he arrived home one day and found it nearly empty — his parents, three of his four siblings and most of their belongings were gone, with only his bed and clothes left behind. His uncle Jesus gave him a place to stay, and it wasn’t until the following day that Fornes learned what had happened: His family had been deported to Mexico. Brenda Batres (left) rested her head contentedly on the shoulder of her mother, Sandra, after learning that she had won a scholarship. Jane Sabuni, her parents and six siblings didn’t have it easy in their native Tanzania, but they were happy where they were until civil war forced them to flee in 2010. They were placed in Phoenix by the U.S. Immigration Service, and Jane was forced to assimilate into school. She didn’t speak English. 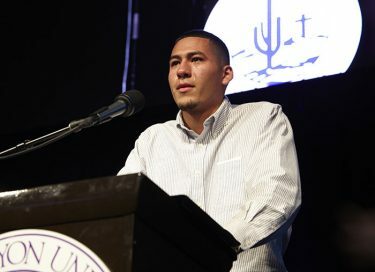 Fast forward from those incredible challenges to the evening of May 12, when Grand Canyon University brought together the first 100 recipients of its new “Students Inspiring Students” full-tuition scholarships for a celebration at GCU Arena. The featured student speakers? None other than Fornes and Sabuni — one left here by fate, the other brought here by fate, but both determined to make fate their friend. 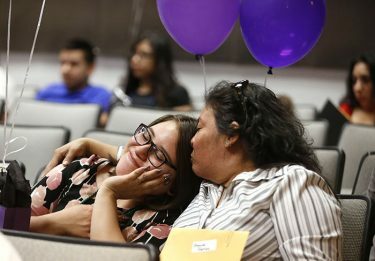 The idea of the program is as simple as it is life-changing for both students and their families: The GCU Learning Lounge has provided free tutoring and mentoring for more than 1,700 neighborhood students from kindergarten through 12th grade since it opened in 2013, and now those inner-city students can earn scholarships, then pay it forward by serving in the Learning Lounge to help the next generation of students behind them. Pahoran Fornes was overtaken with emotion when he tried to explain his gratitude. When Fornes’ parents were living in the U.S., his mother made money cleaning homes and his father was a construction worker. In Mexico, he said, they barely make enough to survive. “Of course I miss them every day, but I’ve learned to deal with it so that someday I can provide for my parents just like they have for me,” Fornes said. Fornes was left behind along with his older brother, Carlos. And yet, despite having to become self-reliant, despite having to keep his home life a secret and despite not knowing when he’ll get to see his family again, Fornes remained focused on his education. He plans to become an engineer. 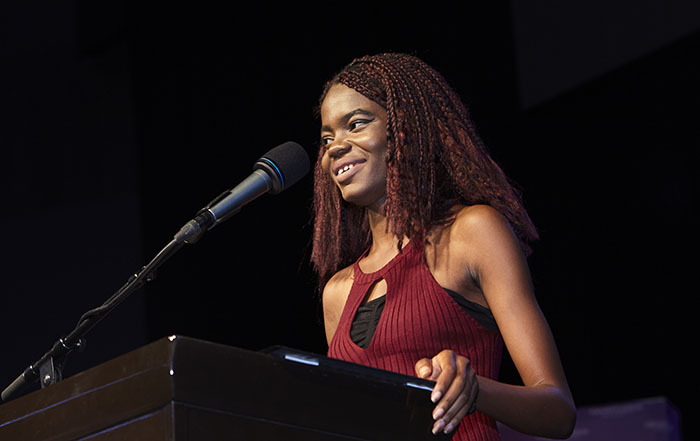 It’s no wonder that Fornes’ speech at the Students Inspiring Students celebration was filled with emotion. He struggled through several long pauses before he was able to finish his message. The reason: It was the first time he had shared with a group what it meant to have a shot at attending college, apart from his family. “Even though I had practiced before so many times,” he said, “it was in that moment that everything came to me.” Fornes has the heart of a servant — he smiles, he’s willing and he carries the right motivation in everything that he does, said Myrna Fornes, his aunt. Jane Sabuni overcame a lot of challenges to get the scholarship from GCU. Now, Sabuni said, those great things are starting to become real. She is proud of graduating from nearby Alhambra High School. “I am a refugee, a minority, an immigrant in a country with many intelligent people, and I was able to do something so big,” Sabuni said. Even though her family’s circumstances have improved slightly, Sabuni worked while going to school in order to contribute financially to her French-speaking parents and her siblings. “As a child, I saw my family struggle a lot — my dad worked two jobs, my mom worked at a meat factory and I wasn’t fortunate to have the life of a normal child,” she said. “I want my younger siblings to know that you can cultivate what you want with the very little that you have.” Sabuni plans to become an entrepreneur and hopes to serve as an inspiration to other refugees. Someday, she would like to open an orphanage. “In Tanzania, we used to live next to an orphanage where my mother would take food to the children, and I would see that and feel that calling within my heart,” Sabuni said. “Although what we had was very little, I was lucky to have parents who provided me with a roof. I was lucky to have water and to have food. That’s exactly what GCU is trying to do, too.